The front brake is absolutely amazing (Magura Marta SL with Storm 203mm rotor and goodridge braided hose) but the rear brake was crap in comparison. Anyhow - to the point, I took a photo of a before sanding/cleaning and after. 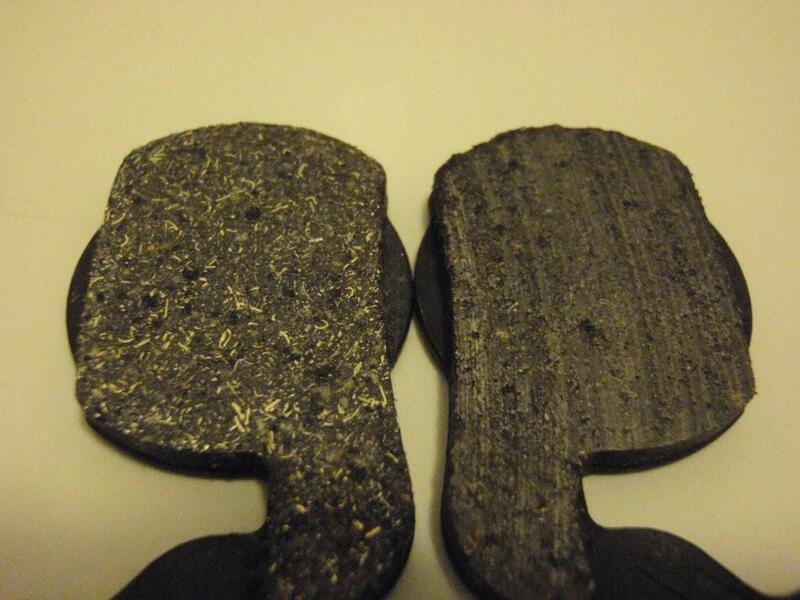 From the before picture, it appears as though the pad is chipped on the edges in a few places. Is this normal ?? is it a result of the rotor (keep on wanting to call it a disc.....) / cut-out edges not being sufficiently chamfered and thus catches the pad ?? What do you guys think ?? any ideas or opinions ? Little chips on the edges are not a concern. I would follow the new pad bed-in procedure after sanding the pads. The worn pad looks fine to me as well. I would clean the pads with rubbing alcohol. If they got anything on them that is not water soluable, water won't clean it off. Don't use brake parts cleaner on the pads. If you still have problems with the rear, please describe the problems in more detail (I'm assuming insufficient power, but can only guess). I wasn't sure if the pads could be cleaned with the muc-off disc cleaner I have, so I used water on the pads and muc-off cleaner on the disc. Will keep rubbing alcohol in mind for next time (hopefully there won't be). The problem has been solved - yes, it was a ridiculously small amount of braking power.